When he's not eating out, Chef LoRusso is eating at home. We wondered, "Does he cook the same way there as he does at Tableau?" "No," he laughs, "I don't have five prep guys!" Instead, Chef LoRusso chooses a more rustic fashion when he's cooking in his home kitchen. The mentality is the same, however. He and his wife shop for fresh ingredients together, but because she is from the South, he has to cook all their meat well - that's how she likes it, he says, and that's the only bummer about cooking at home! 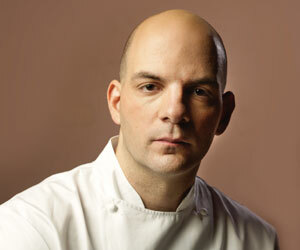 Chef LoRusso also likes doing different types of pasta dishes at home. He's a big fan of Lydia Bastianich. Having grown up in an Italian suburb on the east coast, he enjoys preparing all different types pasta, especially with red sauce, and having people over to eat it. "It's comfort food. Hopefully it's good and that's what people want." At the restaurant, it's a different story. Chef LoRusso's specialty dish during dinner is the Dungeness Crab Ravioli. Because his passion was always Italian food, he puts some pasta dishes on the menu whenever he can. The difference from some other pasta dishes is that this one is made mostly with crabmeat. "When you bite into it," he says, "I want you to think, 'Wow, it's really good.'"